Photo inspiration and a guide to day trekking in Kalam, Swat Valley, for those interested in trekking in Swat Valley, Pakistan. Includes tips on traveling in Swat Valley, and contact information for drivers and guides in Kalam. Taliban rule. Flood damage. Poor infrastructure. With such a trifecta of problems, it’s no wonder people were apprehensive about traveling to Swat Valley in recent years. Being kidnapped by Taliban is, understandably, not high on most people’s bucket lists. Luckily for everyone, both Swati and foreign, times have changed. Pakistan’s army has since evicted the Taliban, and the valley’s villages are getting back on their feet since the record-breaking 2010 floods and 2015 earthquake. The roads are admittedly still wretched in places, but you can’t have everything in life, can you? Pakistani tourists have returned to the majestic mountains of Swat Valley, but foreign tourism is still virtually nonexistent. A friend told us he sees approximately one foreign tourist a month… during high season. Another friend and guide told us his foreign clientele had slowed to a trickle since 2007, and has yet to improve since the days of the Taliban. An although the more remote areas still see land disputes being resolved with guns, the main tourist spots of Swat, such as Mingora and Kalam, are safe for tourists to visit. However, it does help to have some local contacts, as anywhere in Pakistan. We recommend contacting Ihsan from Swat Valley Backpackers. Also, always be aware of local customs and traditions. Swat is a conservative area, so no pda, and be careful where you point your camera. Never take photos of women without permission, and always dress and behave modestly. 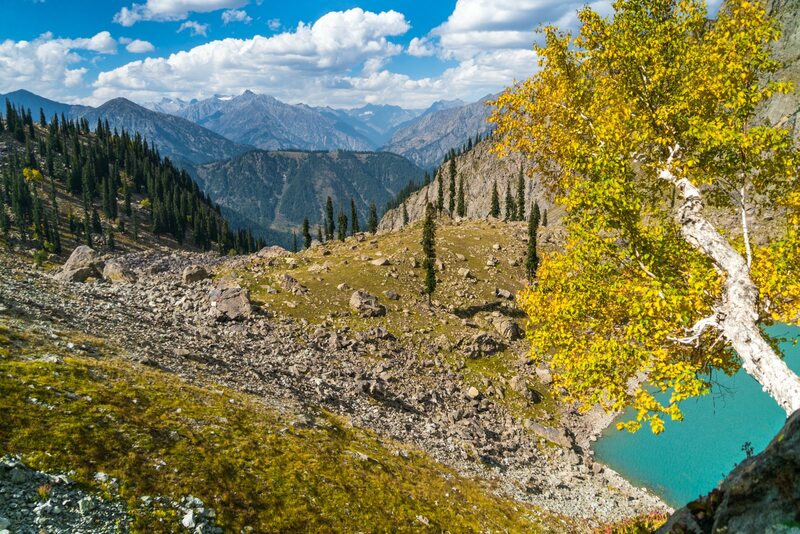 The question remains: where can you go trekking in Swat Valley? I’ll be the first to admit that we’re not particularly skillful adventurers, and trekking is far from our forte. However, we did embark on several day treks (some successful, others… not so much) around Kalam, a popular town in the north of Swat Valley. There are plenty of treks both short and long that start in or around Kalam. In the name of sharing information and encouraging others to get outside and get movin’, here’s a guide to two different day treks around Kalam in Swat Valley, and useful information regarding travel and trekking in Swat Valley, Pakistan. Mahodand Lake is the most popular aquatic destination near Kalam, thanks to a Jeep track running up to the lake. Because of this, it’s guaranteed to be filled with domestic tourists and trash in high season. Kandol and Spinkhor (also known as Spin Khwa) lakes are a much better alternative if you want to get away from the crowds and do a bit of trekking. It’s plausible to visit either of the lakes without a guide in one day, but the likelihood of you finding your way from one to the other without a guide or driver in one day is not high unless you’re a fast trekker and/or very experienced. If you want to trek to the lakes without a guide or driver, you’ll need to start early. Your trek will begin from Utrar, a village about an hour’s drive from Kalam. Shared cars to Utrar run from a parking lot towards the end of Kalam, overlooking Honeymoon Hotel from the other side of the river. They leave when full, and charge between 100 and 200 Rs per person, depending on the whim of the driver. You can expect cars to start going around 7 AM. From Utrar, you need walk to Ladu Valley. To start, take the first big left after the police checkpoint in Utrar, and follow the road above the river (marked as “Gal Rd” on Google Maps) out of the village for a ways, until you see a wooden bridge crossing it by an abandoned hotel. The road is relatively flat, and it should take about an hour and a half to get to the bridge, though it’s quite easy to hitch a ride to that point, as plenty of trucks and motorbikes drive up and down the road. After crossing the bridge, continue to follow the dirt road running along the left side of the river for another hour or two. It will eventually depart a ways from the riverside, and hook up and to the left into a green, grassy area known as Ladu Valley, where you’ll run into another wooden bridge over a stream. When we visited in September, shepherds were living in this area, but they’re not there all year round. Ladu Valley, where the trekking paths split. Up the path and to the left are tracks to Spinkhor, while the dirt path will continue on to Kandol. If you choose to only use public transport, plan to take at least 3 hours to walk from Utrar to Ladu Valley, and make sure to give yourself enough time to hitch a ride back from Utrar to Kalam in the evening. Returning to Utrar before sunset is ideal. We didn’t do this the first time we attempted to reach Kandol, and ended up having to turn back before reaching the lake because it was too late. If you hire a car for this trek, they will drive you to Ladu Valley. A car for the day should cost 3,000 to 4,000 Rs, depending on your bargaining skills and time of year. The car will wait for you at this point until you return. In Ladu Valley, the paths deviate. To get to Spinkhor Lake, a small alpine lake, you must cross the wooden bridge, and then turn left and follow whatever tracks you can find straight uphill for about 3 hours. You’ll eventually reach the tree line, and the lake sits amongst some stark mountains. The path is steep, and you won’t find much reprieve in terms of climb. It’s easier to visit Spinkhor after Kandol Lake, but again, a guide is probably necessary. To head to Kandol Lake, the larger of the two, keep following the track that led you to Ladu Valley, on the left side of the river. Though older maps say otherwise, the paths leading to Kandol Lake are now on the right side of the river once you’re out of the open valley. Cross the small river at some point, and head a bit uphill to find the shepherd tracks leading up and into the valley. After that, you’re basically just walking up the valley until you reach the lake. There will eventually be a downhill stretch into a bit of flat, rocky terrain, and the lake is just beyond the next rocky hill. From Ladu Valley, it should take you about 2 hours to reach Kandol Lake. There aren’t any kinds of facilities to get water or snacks after Utrar, unless you’re lucky enough to run into a shepherd making some chai. Be sure to stock up before heading out, and consider bringing a Steripen so you can drink from the river and lakes without issue! Desan Meadows is a breathtaking expanse of alpine meadows high up in the mountains overlooking Kalam. In the summer, it’s blanketed with green grass, while in autumn the grass turns a rusty brown and the trees transition to gold. Desan is the perfect destination for independent trekkers, as the meadows sit at the end of a long and clear Jeep track. Even better, the track to the meadows begins in Kalam. There are several minor shortcuts that you can take along the way to save time and effort, and they’re generally easy to find, as there will likely be other locals walking up and down the mountain during the day. The difficult part about reaching Desan Meadows is the climb—it’s a long uphill slog, and the highest point is above 3,600 meters (11,800 feet). Breathing isn’t so easy at such altitudes! We began the trek from Walnut Heights Hotel, about 20 minutes’ walking uphill from the Kalam bazaar. The Jeep track begins behind the hotel, and it took us 5 hours to walk up to the mountain pass opening into the meadows. That time included a lot of breaks to heave, ponder death, and discuss how not fit we were, so if you’re a sprightly trekker, you could probably do the walk in 4. Plan on taking 2-3 hours to walk back down to Kalam. It took us 3 hours, but we’d done a bit of chilling at the top of the mountain, so we were slower and clumsier than the average wanderer. There are no facilities for snacks on the way up, but there are mountain streams to refill water bottles at regular intervals for the majority of the uphill climb. The last rocky stretch above the tree line had no water when we went, so be sure to fill your bottle at the wide stream cutting across the path right around the tree line. Don’t count on finding any water in the meadows, either, unless it’s monsoon season. An alternative itinerary for this route is to take a Jeep to the end of the track, then hike from the start of Desan Meadows to a ridge overlooking Godar Lake. Jeeps to the top are about 6,000 to 7,000 Rs, and they’ll wait for you until you return. Because Jeeps are costly and we had no one to share the expense with, we didn’t visit Godar Lake. However, Khalid Khan, the knowledgeable owner of Walnut Heights Hotel, told us the trek from Desan to Godar Lake should take about 2 hours one way. Note that the trek ends at a spot overlooking the lake, not at the actual lakeshore. Don’t fret about that too much—views from above will make for much better photos! Trekking season begins in June, and ends around the end of September. However, short treks are possible in May and October, though it will be cold. The best time to go trekking in Kalam and Swat Valley is the end of September. There are less tourists, and the temperature is much more pleasant than in summer. Most tourist amenities and accommodations are closed in October, so plan accordingly. Don’t count on finding gear to rent in Kalam or Mingora, unless you go trekking with a tour agency. Source your gear ahead of time in Lahore, Islamabad, or Peshawar. Shimshal Adventure Shop in Lahore is a good place to source new and secondhand trekking gear. Swat Valley is a very conservative place, and doesn’t see many foreigners. You’ll probably get lots of stares, and don’t be surprised at all the women in burqa. Women should wear hijab and conservative clothes around Kalam and Swat Valley outside of high season. You can take your head covering off once you get further into nature. Beware, hotel prices soar in high season. High season generally lasts from June to August. Our first room in Kalam was 1,000 Rs/night in September. We looked up the room online, and saw that it was 6,500 Rs/night during season! Bring a plastic bag with you and collect your and others’ trash when you go trekking. It’s not hard, and makes all the difference. Zong is the best mobile network for Swat Valley. You should have 4G coverage throughout Kalam. For more information about trekking in Kalam and Swat Valley, we recommend getting in touch with Ihsan of Swat Valley Backpackers. He and his friends in Mingora help foreign tourists sort out trekking plans and other adventures all over Swat Valley. If it’s in your budget, hiring a guide for trekking is always a nice idea, as they can tell you a bit about the area and, in our case, keep us from accidentally falling off cliffs and/or mountains. We spent one day trekking with Aslam, a Kalam local with plenty of trekking experience all over northern Pakistan and beyond. His English is good, he knows the area like the back of his hand, he’s not overbearing, and he has all kinds of interesting stories to share (ask about his adventure into Afghanistan). He charged us around 2,000 Rs for the day. Highly recommended! Mohammed Zeeshan has a private car, and can drive you to wherever you need to go in Kalam. He doesn’t speak much English, but he’s pretty communicative regardless. He drove us to Ladu Valley when we trekked to Kandol Lake (the second attempt). Phone number: 0331-0174174 or 0314-9467174. Shahi Room and Ashiq Hussain helped us out while in Kalam. They operate an eco tourism information center in Kalam, and offer a Jeep hire service as well. Phone number: 0314-9705982, 0333-9116382, or 0314-9704198. Budget: Mehboob Hotel is not particularly clean, and the rooms are quite basic, but at around 700 Rs per night it’ll have to do! It’s on the main road running through Kalam bazaar. Mid-range: The PTDC Motel is in a lovely spot on top of a hill, and offers small cottages as well as rooms in a hotel building. Rooms are around 4,000 Rs, while cottages run around 6,000 Rs per night. Luxury: Walnut Heights Hotel is an oasis within paradise. Set far from the main road at the base of the mountains, this is the only place in Swat where the “Switzerland of Pakistan” moniker seemed appropriate. It’s easy to while away the hours in their beautiful flower gardens, and the food is delicious. Rooms are around 10,000 Rs per night. Yay transparency! Some of the links here are affiliate links, and the owners of Walnut Heights Hotel invited us to stay at a discounted rate in exchange for promotion of their hotel and the region. Never fear, it actually is like a mountain paradise, and all of our other thoughts, opinions, and derpy moments are our own. Have you visited Malam Jabba? Very informative and a timely article as I was planning to go on trek to the lakes you’ve mentioned. Even though I am from SWAT yet I have to explore and visit the far flung areas. I have been following your guys since you last visited Pakistan and without doubt you are one of my favorite bloggers/travelers. One thing which I wish you could do more is to upload on youtube. Wish you best of luck in your future endeavors. That’s great to hear, thanks a lot. Haha we know what you mean, we are guilty of not exploring our own backyards too. this is the best blog that i have read so far! i swear i can “feel” the flow of your stories. The information that u have shared in this blog is so perfect.. to the extend i have nothing to ask! haha. well done guys! keep exploring and share with us ! im so inspired with your journey. Thank you Guys, indeed one of the best blog. Thanks for the blog! What trekking gear should I bring with me and I assume warm clothes will be needed?